You are Elinor Dashwood of Sense & Sensibility. You are practical, circumspect, and discreet. you have a deep, emotional side that few people often see. I should have known, considering how affected I am by the scene when she finds out Edward loves her and her breath catches and she starts sobbing. It leaves me bereft, yet joyous. Thanks, Suz, for the fun link. It was a bunch of fun:) Do you come into Portland for book functions, often? What grade do you teach? I got a little miffed at the option for: your type of beauty is . . .
Mature-you used to be considered pretty. Hello, can't I be mature and pretty? tjbrown: Yes & yes; I'm proud to be Elinor. I love Portland and come in for whatever whenever I can :) I teach 9-12. 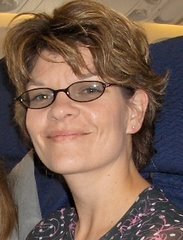 Hope we can meet sometime! jenn: Agreed, good point. We can be mature & pretty; I think the Qs were geared toward the kind of assumptions Ms. Austen made...I hope. I'll get you a good bonnet for your birthday. It would look great when we hit the town. i am elizabeth bennett...i am intelligent, witty, and tremendously attractive. alright, i can live with that. Too fun! 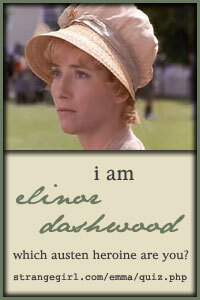 I am Elinor Dashwood as well. Can't be too bad having Emma Thompson play the role!